Lace curtains are best hand washed. If you must wash them in the machine use the gentlest setting. For stains or yellowing try vinegar or epsom salts. 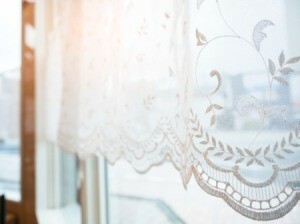 This is a guide about cleaning lace curtains. Could someone help? I would like to know how to wash Austrian lace curtains in the washing machine without getting the strings on the back tangled. If they're very precious to you, you'd probably be better off soaking in a sink or tub and handwashing them. If you're willing to risk putting them in the washer, select the gentlest cycle -- mine has a cycle for items that are supposed to be hand washed. I've put small delicate items into a pillowcase to help protect them in the washer, but I suspect curtains would be too big for that. Just be very careful when selecting the settings on your machine, and keep your fingers crossed! Wash your curtains in warm water and a little hydrogen peroxide and mild soap if you want to get them white. Fold curtains into a square about 15 inches by 15 inches and place in folded form into water. Do not unfold. Soak for about 15 minutes and take press down on folded square to 'wash' out. The lift out in the same folded form. Do not unfold. Put in clean rinse water and press down to rinse til clear. Take out. Put on a clean towel in folded form. roll up in towel to squeeze out moisture. Then you can unfold and hang back up to dry. I was wondering if anyone had any suggestions on the best way to get my lace curtains white again! Can they be put through the washing machine or is hand washing recommended? Always wash on the delicate cycle and to help whiten them add a cup of white vinegar to the wash. My mom used to use this method with tablecloths as well.